The Mercury in Gemini people have excellent communication skills which makes them a multi-tasker. Communication is essential to Gemini, who are known for their interest in education and keeping an open mind. 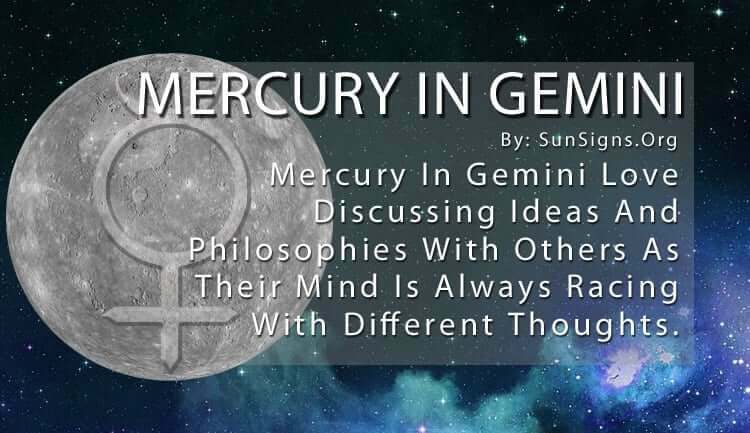 That’s why Mercury in Gemini love discussing ideas and philosophies with others. Their mind is always racing with different thoughts. And, they need to express those things to the entire world. As long as you approach the conversation with Gemini Mercury person in an educated manner, then they will respond to you in kind. They crave intellectual discourse and will show more enthusiasm toward discussions of that nature. Their insatiable curiosity can be tamed by those who take education as seriously as they do. Learning is significant to the Gemini zodiac sign, which is why Mercury in Gemini is insatiable when it comes to acquiring more knowledge. Mercury represents our logic, rational thinking, communicate and decision-making. Since it’s the ruling planet of Gemini that makes it the most restless sign. If you can impart new wisdom to them, they will be glued to the conversation. This also allows them to absorb everything said and helps them to make an intelligent decision. And because of the tolerance of Mercury in Gemini, they can change their mind as easily as the situation shifts around them. That makes Gemini one of the most adaptable signs in the zodiac. The Mercury in Gemini in astrology possess a kind of nervous energy in body and mind, for they absorb everything going on around them. They are hungry for knowledge and can’t sit still. They have to be involved in everything happening within their sight. This is why they seem so scatterbrained sometimes because they are constantly moving from one experience to another. While this helps to grow their wealth of knowledge, it never allows them to truly be experts in any one thing. They retain small bits of information about every topic they come across. But they never absorb all there is to know about any one subject. This also makes them seem a bit detached from the subject matter because they approach everything from an educational experience. As an air sign, they are more concerned with the mind than the heart. So they don’t exhibit any passion for their ideas and beliefs. This may be off-putting for some who are more excited or enthusiastic about the topic. But others have to understand that Mercury in Gemini is more interested in logical pursuits. The Mercury in Gemini can switch directions quite easily and go with the flow when it’s required. It also means you can change their mind if you present them with a logical alternative. While some think this makes them wishy-washy, others realize they are able to understand different points of view. This makes them incredibly likable and draws people from all walks of life to their side. Their acceptance of various beliefs and ideas allows them to communicate and get along with all kinds of people. They are great orators who are never boring. People often come to them when they want to express themselves in a manner that is interesting and exciting. They can look at any situation and discuss it in a way that it is inspiring. They revel in original thought and voice. They also love playing around with the power of language. While Mercury in Gemini isn’t always the most reliable in deeds, their words will always speak volumes. What Is the Ouija Board?